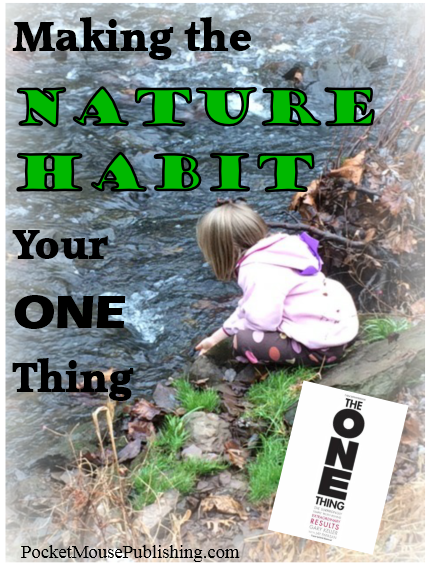 Do You Have a Nature Habit? Do you have a nature habit? Have you made nature part of your daily or weekly rhythm? Sometimes it is hard to make “getting outside” a priority, even when we know the benefits, including recent studies showing the importance of sunlight to vision! I’ve just finished skimming the book The ONE Thing* by Gary Keller. The premise of the book (highly recommended!) is that in order to have more of what we want in our life, we need to focus on less. Our focus needs to be on our ONE thing. He acknowledges that we will have many priorities in our lives, but each of us has something that matters most and that is our ONE thing. Right now, my ONE Thing is getting myself and my children outside every day, as a habit. Just as we eat every day, and we sleep every day — we go outside every day. To notice, to know, to be. The ONE Thing is full of quotes which inspire me to making going outside a daily habit. The key is over time. Success is built sequentially. It’s one thing at a time. The benefits of time in nature happen over time. Getting out every day — whatever the weather — will get us there. Everyone’s “matters most” will be different from their “matters least” – but the thing that screams the loudest for our attention likely isn’t time in nature. And it probably comes via an electronic device of some kind. At least, that generally is the case in my house. So how do we make nature time a habit? He says that we don’t need more discipline; we need more habit. And just enough discipline to form that habit. How long to form a habit? More than the often cited 21 or 28 days, apparently. Gary references a University College of London study which found it takes, on average, 66 days to form a habit. 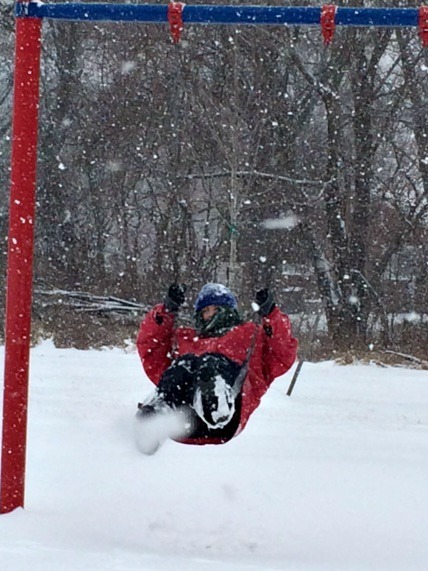 Yesterday was our family’s 34th day of getting outside in a row – we’re halfway to a habit! What habits are deciding your future? Do you have a nature habit? Leave a comment or share a link and let us know! I so need to get a nature habit back in my life. When my son was younger, he’s about to turn 12 now, we got outside every afternoon to play. Now when he gets home there’s all kinds of homework to do and I have to get dinner going so nature is sorely lacking most week days. And it’s amazing how much better we all feel when we get outside. It’s magic! Thanks for stopping by, Jennifer! It is harder to get out with older ones — and yet probably even more important for them (and the adults) to just be outside, even if only for a little bit. I hope you find time this week for some nature magic! I absolutely have a nature habit. It is one of the most rewarding habits I have. It is as good for health and happiness as a good diet and mindfulness. I always feel refreshed, connected and energized after having quality moments outdoors. The best part is a nature habit is a fulfilling vacation habit too. We don’t often do planned and paid activities on trips because a hike in nature or exploring a city neighborhood is a rewarding experience without an admission price too! I think habits form at different rates. Sometimes it takes longer to see the benefit and have a reason to stay committed while other habits form instantaneous from fulfilling experiences and results. I am trying to go out every day, but sometimes I just get excuses – like it’s windy, it’s rainy.. I need to stop doing that. Hi Marina! I have been told “no bad weather, only bad clothing” over the years, and am discovering it’s true. I’ve never been sorry we went for a walk (even if I’d rather have spent the time on, say, your Ultimate Book of Kids Activities!). We try to do Friday hikes. I want to try to include more nature journaling with this but for right now, it’s our day to explore! We are doing much more exploring than journaling these days also! Eventually I hope to make journaling as much of a habit as walking. Thanks for stopping by to explore Pocket Mouse Publishing!